I hope your weekend was filled with lots of fun, and joy. 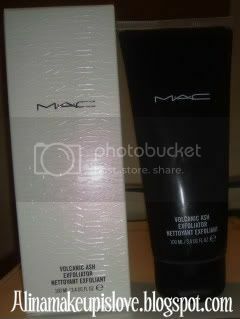 I will conclude this weekend with a review that may interest many of you MAC fans...I am talking about none other than the famous Volcanic Ash Exfoliator-which is a limited edition scrub that was released with the MAC Style Black Collection. This exfoliator also was released with a thermal mask, but I wanted to try this much raved about exfoliator that many seem to stock up on since it is limited edition. 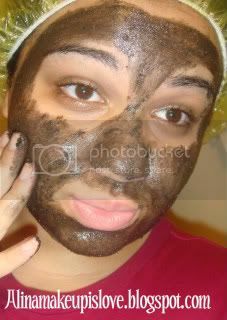 I am a gal' that has gone through my share of different facial scrubs. I still haven't found "THE" Holy Grail facial scrub that blows my socks off. Did this scrub turn out to be my HG of facial scrubs? Read on to find out! 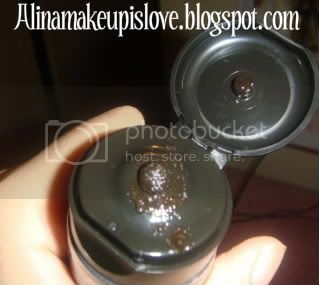 MAC Volcanic Ash Exfoliator squeezed out of the tube. off with warm water, and you can use this scrub 1-3 times per week. I removed all my makeup with a cleansing towelette, and I washed my face with my original Clean and Clear cleanser. I wet my face with water and squeezed a dime sized amount on my hand and rubbed it all over my face. I noticed that the scrub is black and contains little black granules. I noticed the smell of the scrub-and I can't really describe what it smells like. It does not bother me at all, but if I were to guess, I would describe the smell as a bit earthy. I would say that the smell is not pleasant, but it's not bothersome (at least to me). While i was rubbing this scrub on my face, I noticed that the granules were a little harsh on my skin, but they immediately dissolved, which was pretty cool. I have never actually used a scrub in where the granules dissolved. I rinsed with warm water, and my skin was really, really soft. The smell did linger, but it did soften down to a nice clean, and fresh smell. Looks kinda like a mud scrub huh? haha. Overall, this scrub is just average for me, although I did like how soft it left my skin, I wouldn't exactly call this my HG scrub. But it is definitely a nice scrub to have. I use this scrub about 1-2 times a week, and I love the fact that it has not caused any adverse skin reactions such as irritation, and breakouts. Even though this scrub is pretty cool, I am not going to go crazy and stock up on it. I can wait until it is re-released, or becomes permanent as I feel that other drugstore scrubs perform the same as this one does, but for a fraction of the cost. 2. Kind of expensive $21.00 + tax for a scrub, ouch! Grab this scrub while you can loves! I hear this thing is selling out like hot cakes. And money-hungry people sell this stuff on E-Bay for ridiculous amounts...Crazy! Have any of you tried this scrub? Loved it? Hated it? Let me know in the comment section!